A top Midlands orchestra will visit St Chad’s Cathedral on 24th June to play a concert which includes Saint-Saens’ famous Organ Symphony. Birmingham Philharmonic Orchestra, acclaimed by critics as “one of the finest in the land”, have been performing at venues throughout the Midlands and beyond since their foundation in 1941, and earlier this year accompanied a performance of Berlioz’ “Grande Messe de Morts” at Symphony Hall, Birmingham, as part of Newman University’s 50th Anniversary celebrations. This month’s concert at St Chad’s features Cathedral organist David Saint in the Saint-Saens Symphony No 3 in C minor. Another celebrated soloist, Robin Ireland (of the world-famous Lindsay String Quartet), will perform Walton’s much-admired Viola Concerto. 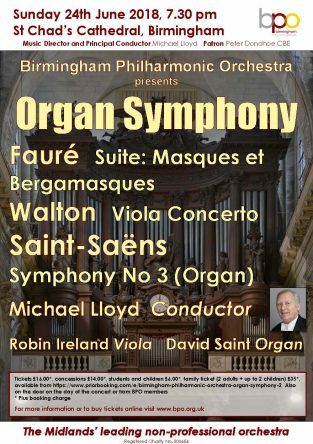 Completing the programme, which is conducted by the Orchestra’s Music Director Michael Lloyd, is Faure’s attractive “Masque et Bergamasque” suite.